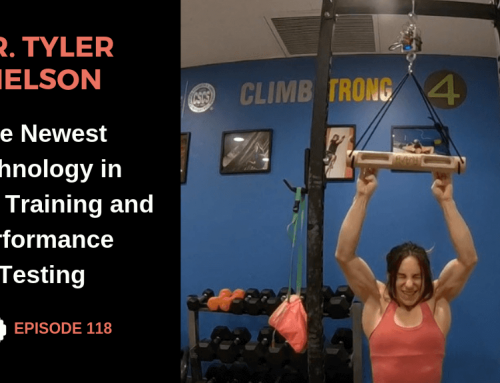 This podcast interview is with Kris “Odub” Hampton, a climber, trainer, artist, business owner, and all around great guy. I met him last fall at his home crag, the Red River Gorge, when we both had projects in the Motherlode (I was on Snooker and he was on Transworld Depravity). He’s a super chill, obviously smart guy, and we were quick friends. 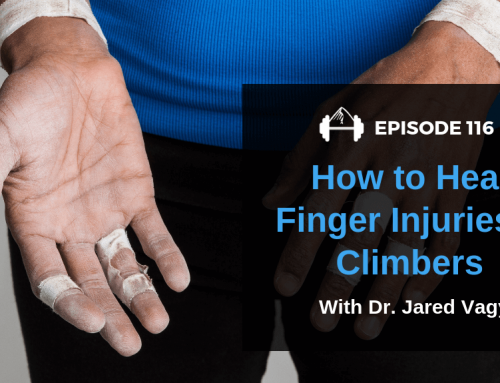 It wasn’t long ’til he was writing the 8-Week Endurance Training Program for TrainingBeta (here), and we were discussing all the ways we wanted to improve the online availability of climbing training advice. 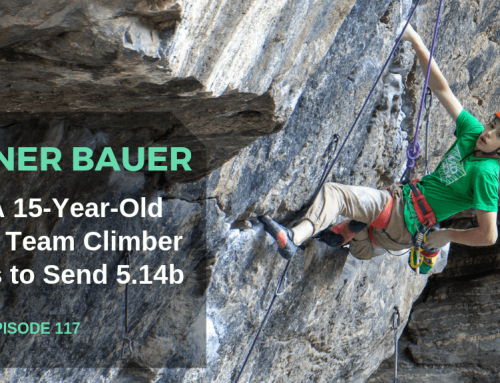 As a climber, he started out as a trad guy and then years later switched over to sport, early in his 30’s. He quickly realized that if he was going to keep up and meet his own personal climbing goals, he’d have to get strategic about his training, especially because he’s so busy with life outside of climbing. So he learned as much as he could about training tactics, and quickly took himself from a 5.11 climber to a solid 5.13 climber, now on his way to hopefully sending his first 5.14a. He represents those people who do NOT climb full time, who do not live on the road. He speaks for and to those climbers who only have a couple days a week to crush it outside (if that), and need to make the most of their time out there, which he does himself handily. 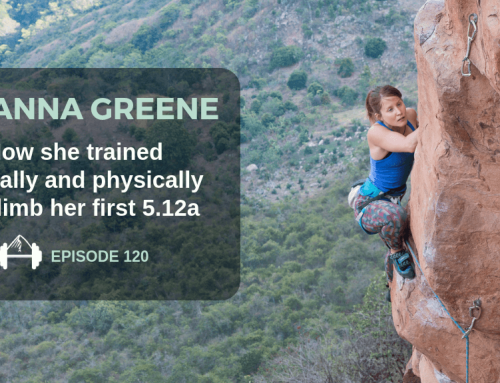 Neely Quinn: Welcome to the TrainingBeta podcast where I talk to climbers and trainers about how we can get a little better at our favorite sport. I’m your host, Neely Quinn. I’m a climber, a nutritionist, and a traveler, and I’m talking to you today yet again from my closet. Yes, it continues to be the quietest place in the house that we live in so here I am. Right now we’re still living in the burgeoning metropolis of Mesquite, Nevada to climb at the Cathedral/Wailing Wall about a half hour away. It’s beautiful limestone and the temps are good even when it’s hot in town. You should come. I don’t know if I’ve ever told you this on the podcast but my husband Seth and I live and climb on the road permanently. People we meet at the crags have been asking how we do this so I figured I’d just clarify that we are not trust-funders, not that I have anything against trust-funders. I actually have a full time job online as a nutritionist for a website called www.paleoplan.com. Since it’s online we can be wherever we want to be which is why we get to follow the good weather to good rocks. Anyway, I really hope you’ve been able to get out and do some climbing yourself. Our next stop is Rifle for the summer so maybe we’ll see you there. 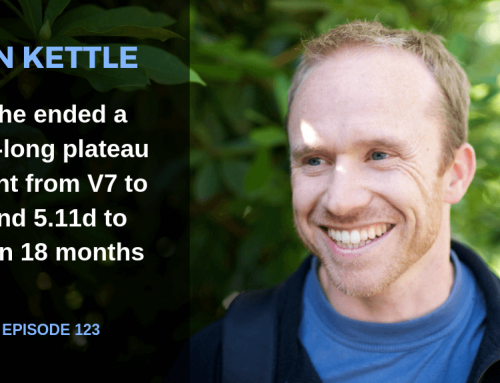 Alright, so we’re on episode six today and before we get into this awesome interview I want to thank you again for your support at TrainingBeta. Today we’re almost at 4,000 likes on Facebook and I can’t tell you how much it means to me that you’re liking what we’re doing. I’m really psyched about that. 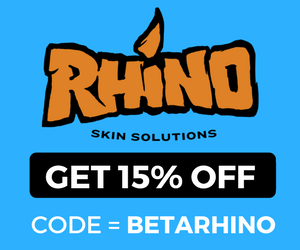 If you want to support the site and our work even more please check out the training programs that you can purchase on www.trainingbeta.com under the ‘training programs’ tab. They’re downloadable training plans and so far we’ve got a six-week power endurance program by Kris Peters that will get you up those powerful routes and boulders and an eight-week endurance program by Kris Hampton that will build your forearm stamina and teach you how to rest on routes better. Again, they’re at www.trainingbeta.com under the ‘training programs’ tab. It just so happens that today I’m talking with Kris Hampton himself. Like I said, he’s the author of our eight-week endurance program and in fact, he just sent me another training program to offer on the site but I’ll tell you more about that in a few weeks after we make it all pretty and nice. Either way, Kris is an amazing climber, a coach, and just generally a really good guy. I met him this fall in the Red when we both had projects at the Motherlode. He’s a no-nonsense guy, which I appreciate. He’s really cool and calm and easy to be around so we were quick friends, as I’m sure you were with him if you’ve ever met him. He’s a familiar face around the Red in the spring and the fall and he travels to other areas around the country pretty regularly, too. He’s climbed a lot of 5.13s and he’s currently working on his first 14a, Transworld Depravity, which with any luck he will have sent by the time you listen to this. There are a lot of people who send 5.13 and a lot now even send 5.14 so it’s not like Kris is the strongest guy in the world. That’s not why I’m interviewing him. Don’t get me wrong, he’s strong, but Kris has a real job, he has a daughter, a fiance, he’s a music producer – a rapper to be precise which we’ll talk about – and he’s pushing 40 years old so he represents the every man and every woman out there who train and crush, even with a normal life. 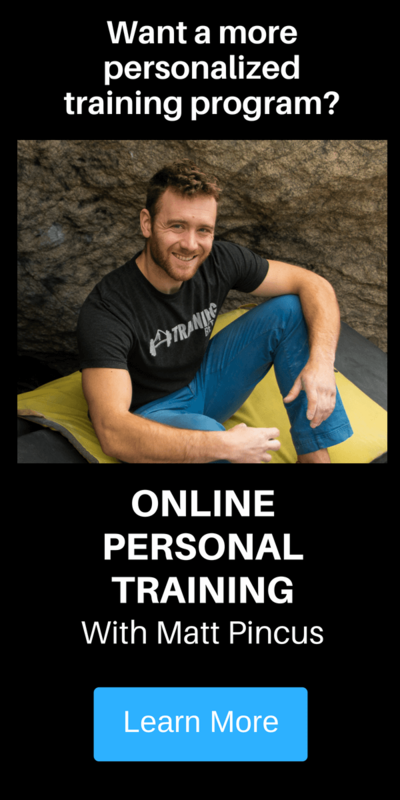 The fact that he has so many other things going on in his life has made him really hone his knowledge and skills and climbing training, and he shares all that info on his website, www.powercompanyclimbing.com. He also creates individualized training plans for people and has had quite a bit of success with them, actually. If you follow him on Facebook just about every other day he’s posting about another person on his team who is reaching their goals. In other words, I tend to listen to what he says and today, you get to, too. 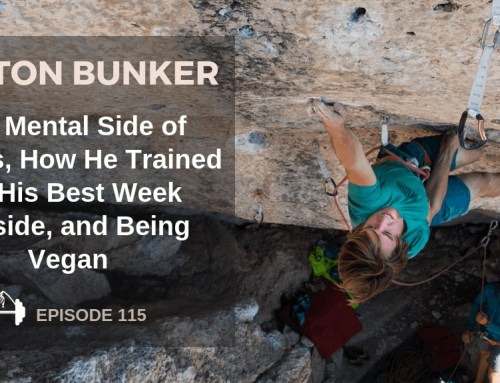 We talk about how he trains, why he trains, his goals, his clients, the training program he built for TrainingBeta, his real life, and how he balances climbing with it all and other good stuff. Okay, here’s Kris. Enjoy it. Neely Quinn: Hey Kris. Thanks for being with me today. Kris Hampton: Hey Neely. How’s it going? Neely Quinn: It’s going great. I just want you to introduce yourself to anybody who may not know you or who you are. Can you just tell us a little bit about who you are, what you do, where you climb, things like that? Kris Hampton: For sure. My name is Kris Hampton. I am 39. I’ll be 40 in October and I climb in Red River Gorge mostly. I spend quite a bit of time in Lander, Wyoming as well. My fiance’s from there so we’re out there quite a bit. I run a company called The Power Company or Power Company Climbing and I train climbers, mostly just average people. I’m not into training superstars or anything like that. I get more out of helping people break through barriers and things like that. I also run a company of mural artists and I’m a musician, so to speak. Neely Quinn: You do a lot. Kris Hampton: I do a lot, yeah. Neely Quinn: Your day job is running the mural artists, right? Neely Quinn: That’s what you mostly do, right? Kris Hampton: Yeah, that’s been my job for the last – I guess I’ve been doing it for 16 years now, 17 years maybe? Something like that. Neely Quinn: So you’re a working artist which is what a lot of people strive to be. Kris Hampton: Yeah. I mean, to a degree. It’s definitely work. It becomes a business as much as it is art, which doesn’t really fit the artist dream, but there are very few people who make a living actually doing just art and no business. I’m lucky. Neely Quinn: You say that you are a musician. Can you talk a little bit more about that? Kris Hampton: Yeah. I’ve been a rapper for longer than I’ve been a climber. I started rapping – actually, I started breakdancing when I was probably 10 and then I started rapping at probably 14 or 15. I’ve kind of been out of it for a little while, just focusing on climbing lately. Just recently I’ve started recording a new album so that’s taking up quite a bit of my energy, especially my creative energy, lately. Neely Quinn: Yeah, I’ve been seeing a lot of updates on Facebook about it. It’s called ‘To Mock a Killingbird,’ right? Kris Hampton: Correct, yeah. It’s been a project of mine for, oh gosh, I don’t know, a lot of years. Since probably 2003 or so. Neely Quinn: What’s the music like? Kris Hampton: Well, it’s hip hop. Basically the way it worked was I had this concept that I wanted to do an album that loosely followed the moral stories and themes from the book To Kill a Mockingbird and a friend of mine found the vinyl of the soundtrack. It’s an Elmer Bernstein score from the movie. She picked that up for me and I just handed it off to one of my favorite beatmakers in town, a guy by the name El Poetic, and sort of gave him an outline of what I wanted. He sampled from the soundtrack to make the beats for me and they were brilliant, which made me a little nervous to rap over them. It’s sort of a lush, instrumental Elmer Bernstein score with the hip hop drums and a hip hop feel to it, basically. Neely Quinn: That’s really cool and I am very excited to hear that. Where could I buy it? Where can people hear it? Kris Hampton: It’s going to be free. It’s a pet project so I just want to put it out there and see what it does. I’ll distribute it all over the place. I’m not sure exactly where. I need to look into the best online places these days because I’ve been out of making my own music for a few years and it changes so rapidly. It’s all new to me again. Possibly Bandcamp? I know that’s been a popular one in the last couple of years and then, of course, SoundCloud. It probably won’t be on iTunes. It will just be a free thing you can download online. Neely Quinn: That’s great. I know you have a daughter, right? Kris Hampton: Yeah, a 16 year old. Neely Quinn: What does your 16 year old daughter think about you rapping? Kris Hampton: Oh she loves it. Her name is Kaitlyn. She actually is really into making beats now and she writes poetry so I’ve been working with her a lot making beats. She currently wants to go to school for music production so we’ll see where it goes from there, but she’s been into hip hop since she was really, really little. She’s performed on a few songs with me and on stage with me a few times. Kris Hampton: Yeah, it’s a lot of fun. Neely Quinn: How do you make time for all of this? All of these things that you do? Kris Hampton: I don’t sleep? No, I’m kidding. You know, it’s actually not as hard as it sounds because I know if I do one thing exclusively I get burnt out. I’m fairly high energy and I like to be doing something. I’m not ADD jittery but I can’t just sit still. I have to be doing something, so if I’m not climbing I want to be writing and if I’m not writing I want to be making a beat and if I’m not making a beat I want to be painting. There’s always some creative energy I need to expend and then when that’s all done, I can sleep. I think that’s the way it works. Neely Quinn: About two hours a night. Kris Hampton: You know, that’s what it used to be but it’s gotten a lot better. I had to force myself to learn to sleep because of training. I wanted to get better at rock climbing and that wasn’t going to happen on my sleep schedule. Neely Quinn: Let’s talk about that. How did you get into climbing? Kris Hampton: Actually, as a way to stay out of trouble. I was a kid who had a ton of energy and needed to do something with it. I found that stealing car stereos and stealing cars was a good way to expend my energy. I grew up in a little town where the kids just ran the streets at night and so that’s what I ended up doing. I got caught and got in a lot of trouble and decided when I was locked up that – and this was when I was 18 or 19 – I needed a hobby. I had gone to a climbing gym one time prior to going to jail and just decided that that’s where I’m going to go the day I get out. I bought a membership and spent all my time there for a while so that I could have a new set of friends and a new lifestyle. Neely Quinn: Was it something that sort of let you get some rage out on the wall? That’s kind of what it was for me. Kris Hampton: It wasn’t really rage for me, it was just something I could put my creative energy into. I never stole car stereos because I was angry or because I wanted to make money or anything like that, it was just because I was good at it so I wanted to do it more and get better at it. That’s what ended up happening with climbing. I just went to the gym more and more because I wanted to get better and better. Neely Quinn: So you started at the gym but I know that you were a trad guy for awhile and an offwidth guy. Kris Hampton: Yeah, I was corrupted early on. A friend of mine, Ray Ellington, came into the gym and he had just come back from Zion. I was still pretty green and I just thought it was the coolest thing in the world, him talking about big walls, so I went trad climbing with him and never really looked back. Actually, the first day I trad climbed with him was the same day I did the first 12a I had ever done. I also did my first trad lead that day and I didn’t clip bolts again for years. I just loved trad climbing. Neely Quinn: What were your proudest moments as a trad climber? Kris Hampton: You know, one single moment I could pinpoint was Squat in Vedauwoo. It was a big deal for me when I did it. It hadn’t seen many ascents and I think, at the time, mine was the fastest. I just think to come from Kentucky out to Vedauwoo, where everybody was scared of the place and the grades are sandbagged and it’s just this brutal, burly place to climb. To be able to do this iconic roof crack there was important to me but, more than that, just the moments where I had to really dial myself in, control the situation mentally, and proceed rather than give in, say, “Take,” downclimb, whatever. Those moments where I was scared, whether it was a realistic fear or not, if I was scared and I could push through that, those moments stick in my mind for sure. Neely Quinn: I bet that they help you with your sport climbing now. I want to talk about that but how did you get into sport climbing? How did you switch over? Kris Hampton: Honestly, I had quit climbing for a couple of years. Quit for the most part. I would go climbing outdoors but I wouldn’t go to the gym at all. I went outdoors maybe twice a year for four or five years and would just go crack climbing with friends. I was just focusing on music at that time and performing a lot out of town and working on a lot of music. Once I got back into climbing the Red didn’t have many more new trad climbs for me to do and I didn’t want to spend all my time on the same couple of routes I hadn’t done, so I started exploring the sport climbing and it was like a whole new world. It grows at a pace faster than I can climb so that’s great. Neely Quinn: And the rest is history. Can you tell us about some of your greatest moments in the Red or in sport climbing in general? I gave it 110% and just barely pulled it out and was able to finish. That night, after walking down from the send, we were staying at the Skinner’s cabin because she was the nanny for the Skinners. Paul Piana was there and I hadn’t met Paul before so I got to have dinner with Paul and just listen to him tell stories all night which was just amazing. Neely Quinn: Yeah, he’s probably got a lot of stories. Kris Hampton: Yeah, that’s for sure the proudest sport climbing moment. Neely Quinn: Can I ask you about that? Recently I was working this project which you know about and it beat me, for now. I had one last go and I didn’t do it. I’m wondering what the difference was between you and me. You were probably tired that day, on your last go, but what was going through your head? How did you get up it? Kris Hampton: You know, I had resigned myself. I don’t like this phenomenon. It happens all the time and I keep hearing more and more about it, that when your expectations are gone, things happen. I’ve tried to – there are lots of examples disproving that, but there seem to be more and more examples proving it and that is definitely one of those cases. My expectations were gone. Until I was through the crux I wasn’t really in fighting mode, I was just climbing. I figured, ‘I’m done. This go is just another go. There’s no way I’m doing it,’ and then once I stuck the move I hadn’t stuck, then it became a battle. At that point, I had it dialed enough that I think I was successful. Obviously, I’ve had just as many times where I’m not successful. In fact, just last season in Lander with my friend Leif Gasch, I did the exact same thing you were talking about. I fell off the last hard move my last try and didn’t get it done. Neely Quinn: That was on what I call the Graham Cracker route, right? Strawberry Roan? Kris Hampton: Yeah, Strawberry Roan, a really amazing experience. We shot a film of it while we were out there. Adam Amick, a Wyoming filmmaker, came out and shot it and we’re going to be premiering that at the International Climbers’ Festival this summer in Lander, Leif and I are. Neely Quinn: Yeah, I was with Leif and he was showing me some pictures, telling me the story. It sounded like a pretty epic few days up there. Kris Hampton: It was really, really cool. You know, sport climbing started for me as a way to stay out of trouble and have a new set of friends but it’s really become a whole lifestyle. As much as I want to just be focused on the, ‘I want to get better,’ and the gymnastics side of it and the athletic side of it, it’s become so much more than that. Getting to share those experiences with somebody like Leif, those are the things I take with me far more than completing a route. Neely Quinn: Yeah, I think a lot of us can say that. I mean, I’m married to the man I’m married to because of climbing and all of my jobs have come through climbing and people that I know. It’s pretty cool how it does that. Kris Hampton: Yeah, it’s such a cool thing. 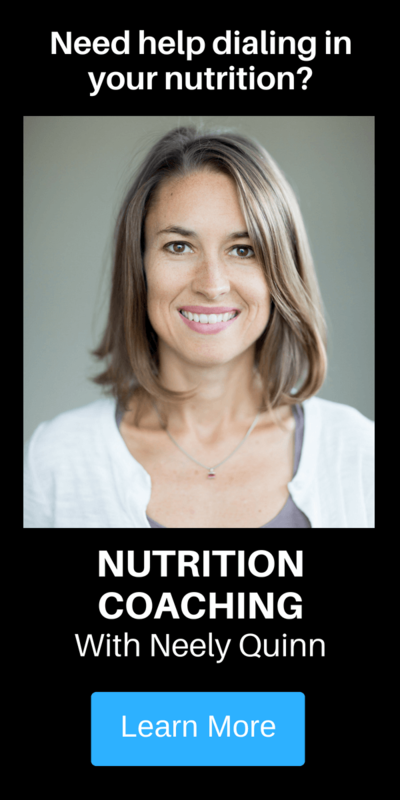 Neely Quinn: I would like to talk about your training and how you’ve improved over the years, what you’re training right now, what you’ve studied, what sort of philosophies you’ve studied, so I guess maybe let’s start with: what are you working on now with your training and why? Kris Hampton: Where am I right now with my training? Neely Quinn: Yeah, like what sorts of things are you training? Are you training a certain weakness? Are you training for a certain route? What have you been doing lately? Kris Hampton: Okay. I think right now I’m basically at a point where strength and power are my main focuses. I think once you have a certain base of endurance and a certain knowledge of how to climb pumped and how to climb fatigued, then there’s not a whole lot of endurance training needed anymore. I think I’ve reached that level so that now I just focus mostly on strength and power. Also, I’m almost 40. I’ll be 40 in October so it’s harder to gain strength, harder to gain power as you age so it’s kind of at a premium to keep those things up as high as you can. The rest of it sort of follows along, like I said, once you have that knowledge of how to climb. Neely Quinn: So you’re training strength and power. What exactly does that mean? How often are you training and how often are you climbing outside and what sorts of things are you doing? Kris Hampton: Well, I’ve got a pretty nice set-up in that the Red has two very distinct seasons and two very distinct off-seasons. The off-seasons are really off-seasons. If you climb in the summer in the Red, you’re a nut, period. I did it for a lot of years and I’ll probably never do it again because it’s gross. It’s like a jungle, just not fun at all, especially once you’ve climbed there for a lot of years and there’s not much left to do at lower grades. It’s not very fun to slip around. I’ve got those training seasons already set aside for me so I can spend a few months – I prefer to break it into 12-week blocks, three, four-week blocks within a 12-week period. That’s how I train now. Or, two, six-week blocks. 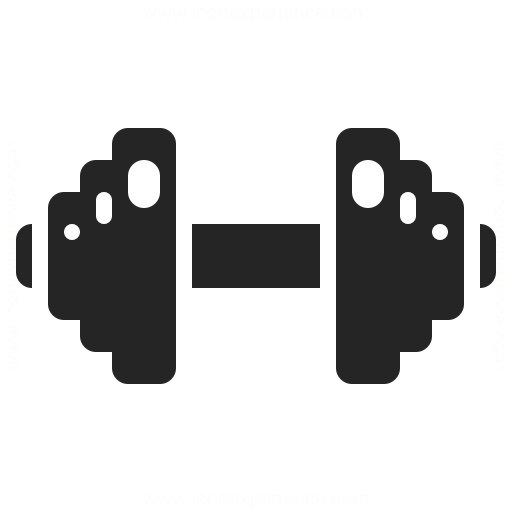 Largely, my strength phase consists of finger strength training and just general body strength training, particularly pull muscles. Then the power phase is more about just getting the muscle fibers recruited that I’ve built up through my strength phase so there’s quite a bit of campusing, quite a bit of dynamic sort of bouldering, and I’m still hangboarding through the whole thing. I just switch up the way that I’m hangboarding depending on what the phase is. When I’m strength training, my hangboarding is heavier hangs and then when I’m power training my hangs are on smaller holds with no added weight, just going to tiny, tiny holds. Then, I system board throughout the whole thing and I just switch it up depending on the phase. Strength training I’m doing more single hard moves, moving more static. I’ll try to pretend I’m Daniel Woods when I’m strength training and then when I’m power training I’m more like Chris Lindner or somebody who’s really jumpy, or Sharma. Neely Quinn: So your gym, I’m assuming, has all these things or do you have your own training facility at your house? Kris Hampton: Well, the gym that I climb at, RockQuest, is one of my sponsors and they have most of what I need. The things that they didn’t have, they allowed me to take a space in the gym and use it just for the Power Company. We call it The Engine Room and that’s where our system board and a little, small but very fierce bouldering wall is. We do a large majority of our training up there. It’s nice because we’re not in the way of everybody in the gym when we’re out there doing our own training. Kris Hampton: There’s a little group of us. It’s been really fun. People start to catch on as you train and you get better. They see what’s going on and they want in on it so I train a group of climbers. My fiance, Annalissa, a young couple named Taylor and Sarah who are the stars of our little team. They’ve grown a ton in the last couple of seasons and it’s been really fun to watch. Then some other friends. A guy named Jeff Kayse, Yasmeen Fowler, Red River locals, mostly, that are in our little group. Neely Quinn: That’s cool. You train them and are these your clients that you’re creating training programs for? Or is it like a group…? Kris Hampton: They are all clients. They do pay for training programs, and then there are lots of other clients. This is kind of the core group that I climb with outside as well. These are the more hands-on, core group of people. Neely Quinn: Yeah. Let’s back up a little bit because we kind of skipped over the part that you’re making these training programs for people. Let’s start with your website and why that started, what kinds of things you do on your website, and how you ended up training people. Kris Hampton: Okay. The website is www.powercompanyclimbing.com. It’s a blog that I keep up and it started because I like to write and I wanted something to write about that I was interested in. I was doing all this training and starting to come up with my own ideas about training and I had read enough that I could take all these pieces and kind of pull them into the climbing world. I was reading things from other places – Bruce Lee philosophies and things like that – and trying to incorporate them into my climbing. That’s what I started writing about, just trying to write in a way that’s more conversational, more interesting to the average person, less scientific. I’m not schooled at all as a trainer or as a physiologist. I’m not trained in any way in a school manner so I don’t speak scientifically about it. I love to read it and I understand it and then I put away all the big words I don’t need and try to talk to people in a way that they’ll understand, in a way that I would understand. Neely Quinn: Right, which I think we all really appreciate and it’s part of the reason that I put together TrainingBeta and why we’re working together on it. We both want people to know exactly what to do in layman’s terms so it’s pretty cool. It seems like you’ve used yourself as sort of a guinea pig for some of these philosophies and methods that you’ve studied. Kris Hampton: Yeah, absolutely. That’s my whole plan behind The Power Company, is that I’m not telling you to do this just because I read it and I think it will work, I’m trying it on myself first. If I screw my season up because my training didn’t go well then I’m not going to tell somebody to do that. Basically, I’ve been through the whole thing. When I started training, getting back into climbing, 5.11 felt impossible to me. 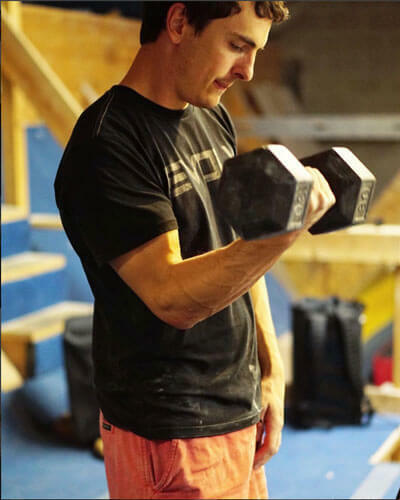 I remember going into the gym and just getting beat up on 5.11s and thought, ‘Oh, this is going to be a tough road,’ but I trained hard and figured out what to do and made a lot of errors along the way. I spent way too much time training endurance so I would never suggest someone do that now because I know better. Neely Quinn: Just laps and laps? Kris Hampton: Yeah. For years I just did laps and laps and laps and laps. I could hang on forever but I couldn’t do a single hard move so I learned my lesson and I can pass that on. Neely Quinn: Right. There was a certain point where you started climbing a bunch of 5.13s in one season, right? Kris Hampton: Yeah. Basically, I sort of subscribe to the idea of building up a pyramid of routes, building a big base underneath you. I had done 70 5.12s before I even touched a 5.13. I did those 70 5.12s in just a couple of seasons, but I didn’t want to just jump on 5.13 because people were telling me, ‘Oh, you should be jumping on 5.13.’ Once I did 5.13, I did a lot of them. I did a bunch of 13a’s that season and my first 13b that same season and still, I didn’t get on 13c until I had done a bunch of 13a’s and 13b’s. I just like to build that base and eventually that kind of peters out because you A) start to run out of routes if you’re local to one area and B) if you’re going to push your limits to the limits of your potential, then you have to just spend a lot of time on something hard. That whole base idea peters out at some point as you’re getting closer to your ceiling. Neely Quinn: And it seems like you’re pushing your limit right now. Can you talk a little bit about your current project? Kris Hampton: Yeah, I kind of made, what seemed at the time, a ludicrous goal for myself maybe five years ago, four or five years ago. I just decided I want to climb 5.14 by the time I was 40. At the time I don’t think I had done 13a yet. Maybe I had? It just seemed crazy because when I started climbing, there were only a handful of 5.14s in the country and only a handful of climbers doing them. At the time, Ron Kauk was maybe the best climber in the country. Boone Speed was around and was one of the few sport climbers doing 5.14s so it just seemed crazy to think that. Even though it’s become a warm-up for a lot of these kids, it’s just another generation. They’ve come at it with a different mentality and can see it in a different light than we could. I’ve really learned from them, as well, looking at what’s possible and just kept plugging towards it. Now I’m on the verge of it. It could happen this weekend, it could happen any moment, who knows? I think that’s awfully close to my limit. I think I could maybe climb harder, I just don’t know if I want to put that amount of time into climbing harder when there are other, bigger things I want to do. Sport climbing was really a way to get better at trad climbing so I would like to take all these newfound sport climbing skills to bigger places, big walls. I think it’s pretty close to my physical ceiling and it’s fun to be approaching that. Neely Quinn: Yeah, it is, and it’s cool to watch you on it, too. I mean, you were projecting your project when I was on a project right across the wall and we would watch each other from our projects. Kris Hampton: That was really fun. Neely Quinn: Yeah, it was really fun and it’s awesome to see somebody pushing their limit like that, especially on such a beautiful route. I don’t know if you want to share which route it is. Kris Hampton: Oh yeah, sure. It’s Transworld Depravity. It’s a Bill Ramsey route in the Red, a 14a out the edge of the Madness Cave. I had gone up several of the other 14a’s in the Red and really hadn’t been terribly inspired by them. One is really short and, for its grade, it’s super, super soft and I could tell that just going up it a few times. Another was just a little more mindless, more like most people think of cave climbing in the Red. I just fell in love with this one. It’s got interesting moves, there was a sequence I didn’t do on it the first whole bunch of times I got on it, so it just seemed like a bigger challenge. It’s really fun, the moves are great, so that’s the one. Neely Quinn: Yeah. How many days a week do you climb at this point? Kris Hampton: Let’s see. When I’m in training mode I train 3-4 days a week. It depends on what I’m doing. Some days will just be a hangboard workout so at that point I could maybe do five when I’m at that phase, but definitely no more than five days a week. Two of those would be really short workouts. Neely Quinn: What’s really short? Kris Hampton: Just like an hour-long hangboard workout or an hour and a half of really low intensity movement, basically. I don’t even like to call it climbing. That implies that you’re trying hard. It’s more about movement and just paying attention to the way you move and your technique and breathing. I’ll do a day or two of that every week when I’m training and then, when I’m in outdoor climbing season, I climb every week at least one day. I get down every Tuesday during the spring and fall and then I try to go on the weekends every other weekend. I get, on average, seven or eight days a month to climb outside and then I’ll do hangboard workouts or short, intense bouldering sessions between those days, depending if I’m climbing on the weekend or not. Training season: 3-5 days, outdoor season: 2-4 days. Neely Quinn: What do you think is the most important change that you made to your climbing from when you were just doing a bunch of laps to now? 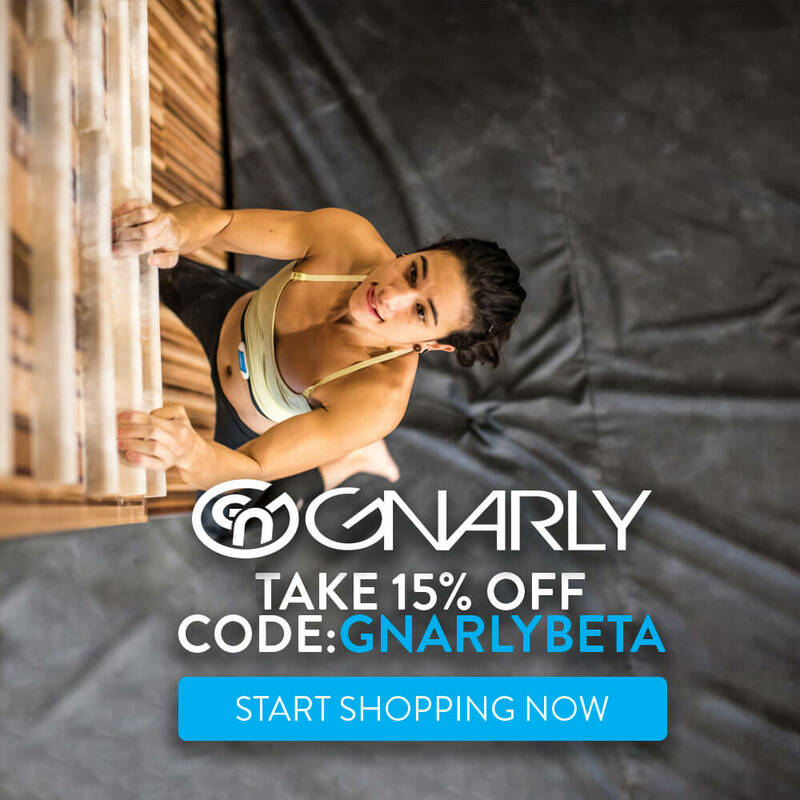 What do you think is the biggest thing that made you switch from being a 5.11 climber to potentially a 14a climber? Kris Hampton: You know, I would have to say that the biggest lesson that I learned, that I don’t think is obvious, is that going bouldering doesn’t mean you’re gaining power. A lot of people would just say, “Oh, you need to go boulder. You need power.” I would go bouldering and I wouldn’t get any stronger. Basically, what was happening is I was going to the gym and getting on boulder problems that fit me, that were long, they were more endurance-y or power endurance, and I would call that going bouldering. Really, what you need to do and what I learned that I needed to do that I was totally skipping over is I learned that I needed to attack my weaknesses instead of attaching a ‘fix it.’ Bouldering = power. That’s not true. My weakness is power so I really need to focus on the power and work on one or two moves at a time or two or three moves. Short, little sequences. That’s not what I was doing. I was just fitting myself into it by going at my strengths instead of attacking my weaknesses. Neely Quinn: Do you do any weightlifting now? Kris Hampton: A little bit. Mostly hanging and pulling exercises with extra weight. I don’t have – I would love to do compound lifts, Olympic-type lifts. I’ve done quite a bit of weightlifting in the past but now I just don’t have the facility to do it. If I did, I certainly would incorporate it into my strength phase and into the early parts of my training season and here and there throughout the entire year. It’s one of those things that I have to make a trade-off because my time is limited and there are some things I just can’t fit in. Neely Quinn: Yeah. I ask just because it’s something that I recently started doing and so I’m wondering what everybody else thinks of it and how they use it because when I first started working on that project I was talking about, it has a lot of underclings and sidepulls and so I started doing a lot of curls. It actually helped a lot. Max curls and things like that. Kris Hampton: Sure. I think that if that’s something that is a weak link in the chain then that’s definitely something that you should be doing or anyone should be doing. I just happen to have a generally strong body to begin with. I’m not the wiry climber who doesn’t have the muscular body. I was a gymnast and was an athlete before I was a climber and I’ve weight lifted a ton through high school and college so I already have that background, so I don’t need as much as some of the people I train. They can definitely benefit from it more than I can. Neely Quinn: Let’s talk about that a little bit. When you get a client – and I know that people contact you through your website because they like your work and they trust what you’re saying and they want your help – when you get a new client, how do you approach putting together a program for them? Kris Hampton: Well, I have a questionnaire I have everybody fill out. I’d love to see people climb but that’s not always possible if they’re remote and not where I’m at, so I try to trust what they’re telling me. I’ve got some specific questions that I ask, trying to get to the bottom of what’s going on instead of just what they think is going on. I’ve found that most people will think the problem is one thing when it’s actually another. Neely Quinn: Can you give an example of that? Kris Hampton: Sure. Especially in the Red, if someone is falling off the crux of their project and the crux is at the top, they automatically believe, ‘I just don’t have the endurance.’ It could very well be that they just don’t have the power in reserve to do that move and if they had one more V-grade worth of power, without training any endurance, that move wouldn’t take as much away from them and they would get there with enough in the tank to do that move. In a case like that I’m not suggesting someone trains more and more and more endurance. I’m going to move them to power whether they like it or not. In fact, one of the success stories of The Power Company, Yasmeen Fowler, resisted for a long time. I kept trying to pull her out of endurance training. She had seen some good gains from endurance training but I saw that it was just she was starting to beat her head into the ceiling and wasn’t going to get any stronger unless she got some real power. In her mind, ‘I’m falling because I’m pumped,’ means, ‘I need more endurance.’ In reality, it was: you need more power so those moves aren’t as hard for you and then you’ve got tons of endurance and tons of knowledge about climbing pumped. Now, she’s crushing everything. Neely Quinn: That’s what I’ve been hearing. Did you have her start campusing? Kris Hampton: No, she just started with bouldering. Really, really short sequences. We would go through a phase of 1-3 moves and then we’d go through a phase of 5-7 moves, trying to connect short sequences that you had worked on in the previous phase. She saw some huge gains from doing that while simultaneously, purposefully, gravitating toward problems that feel awkward to you. If there are techniques that you don’t know very well, like if you aren’t good at jumping, then I’m going to have you doing some jumps. If you really don’t like gastons, I’m going to have you do gastons. That’s just the way it goes. If you’re attacking your weaknesses you’ll see bigger gains and that’s what we had to do with her. Once she started doing hard moves she started to really love doing hard moves. Neely Quinn: That’s cool. You’ve seen quite a bit of success with your clients it seems like. Kris Hampton: Yeah, it’s been a lot of fun. I’ve recently discovered that it’s almost just as cool for me to see them succeed as it is to succeed myself. You know, I realize I’m reaching the limits of what I want to give to climbing as far as difficulty goes so it’s really fun to see these guys pushing hard and reaching new levels that they didn’t think was possible a year or two ago. That’s really rewarding for me. 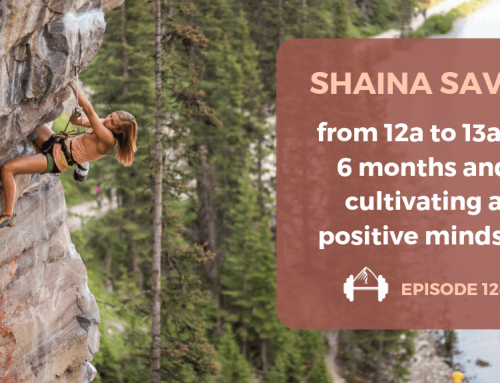 Neely Quinn: Let’s talk about the training program you created for TrainingBeta, which is the eight-week endurance program. Who do you think should use that program? Kris Hampton: That’s definitely built for the climbers who are just breaking into 5.11 or just breaking into the 5.12 grade. Really, for me, that type of training, as much as physical endurance, it’s teaching you how to climb endurance. There are a lot of times that I talk to clients and I say, “Okay, for this warm-up I want you to stay on the wall for 30 minutes, just climbing well below your threshold,” and they look at me like, ‘Thirty minutes? I’m supposed to be on the wall for 30 minutes?’ Some people just don’t get it. They don’t realize that that’s what you have to do sometimes. To be able to stay on a wall almost indefinitely at a specific level, whether that level is 5.11 for me or 5.9 for someone else or 13a for Jonathan Siegrist, you need to be able to know that you can climb at that level for an extended period of time. I don’t think climbers learn that just through bouldering a lot and going out and getting on routes. If someone is a route climber – and that’s what this program is for, it’s for route climbers. 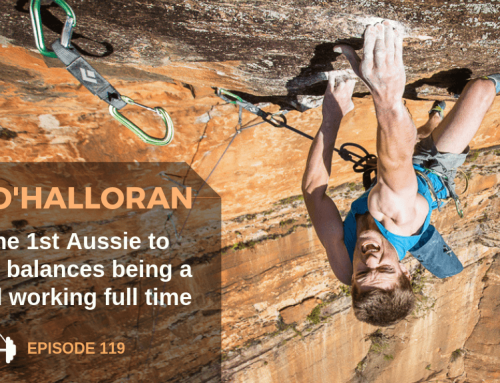 I certainly wouldn’t give this to a boulderer – then I think you need to know about climbing endurance and that’s what I think this teaches. Neely Quinn: I think it teaches a lot about the mental aspect of it, just like you said. They didn’t believe or they didn’t think that was possible or even necessary to be on a wall for 30 minutes. I know I’ve had some sends that took at least 30 minutes. Kris Hampton: I think I’ve rested at a hold for 30 minutes before. Neely Quinn: So have you used this exact program with people before? Kris Hampton: Not exactly. I’ve used every part of it for people. Generally, the programs I write are specific to that person so this one is a little more generalized and, frankly, I think will work just as well for that level. You really don’t need to be specific until you’re into the harder grades or into what’s harder for you. I’ve personally done every exercise in there quite a bit and most of my clients, almost all of my clients, start on that on an endurance phase that’s very similar to what’s going on there. In fact, I did it for a lot of years. Way, way, way too much time. I’ve done all those exercises more than anyone will. Neely Quinn: Well, it worked for you for awhile and I think that’s what the goal is here, just to get people up to a certain level and get their endurance up to a certain level and have them be comfortable resting on routes and know their limitations, or know their abilities, actually. Kris Hampton: Yeah, I don’t think there is a magic training program. There’s nothing you can just follow from now until the end of time and you’re going to keep getting better. That’s one of the really cool things about your site, about TrainingBeta, is that people can come back and find the next program they need. They can come back and get what they need from you so I think that’s a great thing. Neely Quinn: Thanks for being a part of it. Kris Hampton: I’m really excited, too. As soon as I saw that you were doing that, and I had actually just met you when you posted it up on Facebook that you were starting this website, I thought it was a brilliant idea and had to jump in and try to be a part of it. Neely Quinn: Yeah, it was perfect timing. 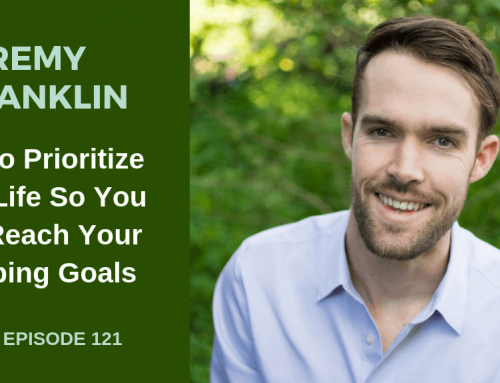 I think we’re nearing the end of this interview and I just want to see what your goals are. I know what your immediate goals are this year in climbing but if you do send next weekend, will I even see you in the Red in October or are you just going to quit? Kris Hampton: I’m quitting. I’m done. I’m going to Disneyland. No, I may be in the Red in October. I’ll definitely be there quite a bit in the fall but one of my biggest goals, ever, as far as climbing goes is that I wanted to try big free routes. I don’t mean I want to put a big siege on El Cap and spend weeks and weeks on it like Tommy does. I admire that but I don’t think I have that in me. It’s just not the lifestyle that I have so I would love to go up some big free stuff, free as much of it as I can. I can pull on cams or rest on gear or whatever and I’ll be totally okay with that but I would love to just be trying to climb as hard as I can climb a few thousand feet off the ground. That’s where I’m headed if I can get this thing done this spring. I’m going to try and spend as much of October as I can in Yosemite. It probably won’t be much this year just because of work and family obligations but in a couple of years I plan on trying to climb more. Less work, more play. Neely Quinn: That’s exciting. That’s really exciting. Kris Hampton: It’s going to be a lot of fun. My fiance’s done with school in a couple of years and our deal is that I’m basically supporting her life right now so she can support mine for a couple after she gets a job. I’ve got a bunch of money put away so I can spend a couple of years just making a little bit of income here and there doing creative things and go climbing. Neely Quinn: It sounds like you’ve got it all figured out. Kris Hampton: I’m doing it a little backwards but I think I’ve got it figured out. Neely Quinn: I don’t know if that’s backwards. Alright, so we can find you at www.powercompanyclimbing.com and your new album will be out and people can find it. Is there going to be a Facebook page for it? Kris Hampton: Probably not a Facebook page for the album. Actually, on April 4th , which is two days from when we’re talking now, I’ll be putting out the first song which is a tribute to Dr. King. April 4th is the anniversary of his assassination and there are several speeches sampled into this song from Dr. King and from people talking about Dr. King. That directly relates to the themes of To Kill a Mockingbird so that one will come out in just a couple of days from now, so by the time everyone’s hearing this it will be out. Then, I’ll follow up maybe three weeks, maybe a month later with a couple of other songs and then hopefully the full project will be out by summer. Neely Quinn: Cool. Alright, well, good luck with it. I’m sure it will be awesome and I’m excited to hear it. Kris Hampton: Thanks. I appreciate it. I’m sure I’ll be seeing you this fall. Neely Quinn: Hopefully, if you’re not stuck up on the Dawn Wall. Kris Hampton: [laughs] I don’t think I’m going to be there, although I could take pictures. Neely Quinn: Alright, well thank you so much for talking to me. 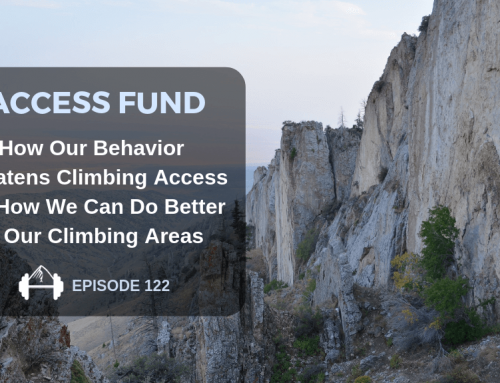 This was really fun and really helpful to hear your insights on training and your own climbing. I really appreciate it. Thank you. Kris Hampton: Yeah, thanks for having me, Neely. 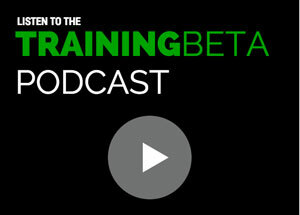 Neely Quinn: Thank you so much for listening to the sixth episode of the TrainingBeta podcast. I hope you liked my talk with Kris Hampton and Kris, thanks so much for taking the time to talk with me. You can check out Kris’s website at www.powercompanyclimbing.com and you can always find this interview on www.trainingbeta.com under the ‘podcast’ tab. I would love it if you would leave an honest review on iTunes of the podcast. The more reviews it gets, the more people the podcast will reach. One last thing: if there is anyone you would like me to interview, please let me know in the comments section and I will try to make it happen. Alright, until next week, happy climbing. Would love to hear one with Tommy Caldwell. Have been a big fun of your website and podcasts. But this episode did not interest me as much, got bored and didn’t finish listening – not sure why, just want to share my honest opinion.